Alfred Thomas Cross was born in Moreton in 1899, one of twelve children born to William and Adelaide Cross (nee Higgins), an agricultural worker. Alfred was called up for service in May 1917, and received basic training with one of the Young Soldiers battalions of the Devonshire Regiment. He was then sent to the front with the 2nd Battalion. On 27th May 1918, the 2nd Devonshire’s were part of the 8th Infantry Division, when they came under attack on what was the first day of the Third Battle of the Aisne, the last German offensive of the war. In a rearguard action at the Bois des Buttes the battalion solely held the line, giving the remainder of their division time to withdraw, but it was at the cost of over 550 men of the battalion being killed or captured. Alfred was wounded and captured, probably when the Germans over ran the local casualty clearing station at Mont Notre Dame. He died there of his wounds on the 6th June 1918 at 19 years of age, and was buried in the local military cemetery. In March 1923 his body was re-interred in. 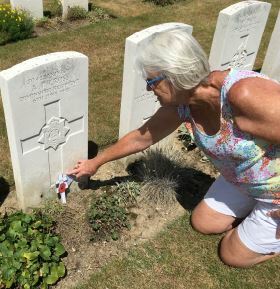 70422 Private Alfred Thomas Cross, Devonshire Regiment, is buried in Vailly British Cemetery, Aisne, France He is remembered on the war memorials in both Thame and Moreton and also the memorials boards for St Mary’s and All Saints churches and Moreton chapel.